New for Business Continuity Awareness Week! You have the knowledge and skill to create a workable Business Continuity Management (BCM) program – but too often, your projects are stalled while you attempt to get the right information from the right person. Rachelle Loyear experienced these struggles for years before she successfully revamped and reinvented her company’s BCM program. 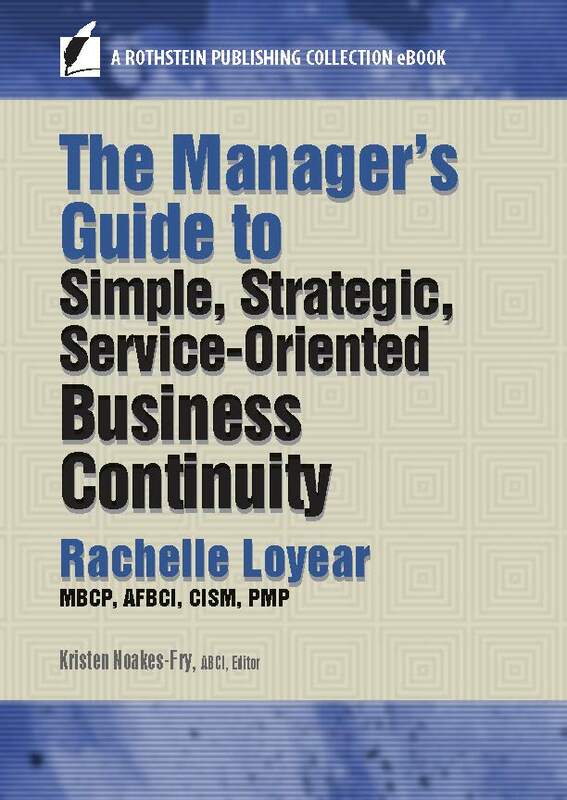 In The Manager’s Guide to Simple, Strategic, Service-Oriented Business Continuity, she takes you through the practical steps to get your program back on track. Simple solutions when they are faced with something new and different. Strategic use of their time, making their efforts pay off. Service to be provided, lightening their part of the load while still meeting all the basic requirements. These tactics explain why the 3S program works. It helps you, it helps your program, and it helps your program partners. Find new ways to engage and support your BCM program partners and subject matter experts. Develop easier-to-use policies, procedures, and plans. Improve your overall relationships with everyone involved in your BCM program. Craft a program that works around the roadblocks rather than running headlong into them. BUY eBOOK NOW FROM GOOGLE BOOKS! BUY eBOOK NOW FROM AMAZON! 2017, 145 pages. EPUB ISBN: 978-1-944480-36-3 PDF ISBN: 978-1-944480-37-0, $24.99.